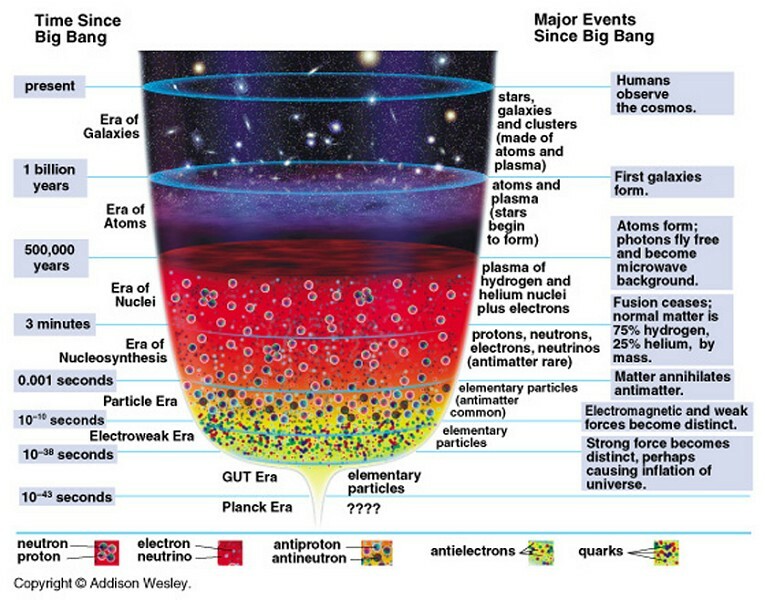 Since the Big Bang, 13.7 billion years ago, the universe has passed through many different phases or epochs. Due to the extreme conditions and the violence of its very early stages, it arguably saw more activity and change during the first second than in all the billions of years since. This is the closest that current physics can get to the absolute beginning of time, and very little can be known about this period. General relativity proposes a gravitational singularity before this time (although even that may break down due to quantum effects), and it is hypothesized that the four fundamental forces (electromagnetism, weak nuclear force, strong nuclear force and gravity) all have the same strength, and are possibly even unified into one fundamental force, held together by a perfect symmetry which some have likened to a sharpened pencil standing on its point (i.e. too symmetrical to last). At this point, the universe spans a region of only 10-35 meters (1 Planck Length), and has a temperature of over 1032°C (the Planck Temperature). The force of gravity separates from the other fundamental forces (which remain unified), and the earliest elementary particles (and antiparticles) begin to be created. Triggered by the separation of the strong nuclear force, the universe undergoes an extremely rapid exponential expansion, known as cosmic inflation. The linear dimensions of the early universe increases during this period of a tiny fraction of a second by a factor of at least 1026 to around 10 centimeters (about the size of a grapefruit). The elementary particles remaining from the Grand Unification Epoch (a hot, dense quark-gluon plasma, sometimes known as “quark soup”) become distributed very thinly across the universe. As the strong nuclear force separates from the other two, particle interactions create large numbers of exotic particles, including W and Z bosons and Higgs bosons (the Higgs field slows particles down and confers mass on them, allowing a universe made entirely out of radiation to support things that have mass). Quarks, electrons and neutrinos form in large numbers as the universe cools off to below 10 quadrillion degrees, and the four fundamental forces assume their present forms. Quarks and antiquarks annihilate each other upon contact, but, in a process known as baryogenesis, a surplus of quarks (about one for every billion pairs) survives, which will ultimately combine to form matter. The temperature of the universe cools to about a trillion degrees, cool enough to allow quarks to combine to form hadrons (like protons and neutrons). Electrons colliding with protons in the extreme conditions of the Hadron Epoch fuse to form neutrons and give off massless neutrinos, which continue to travel freely through space today, at or near to the speed of light. Some neutrons and neutrinos re-combine into new proton-electron pairs. The only rules governing all this apparently random combining and re-combining are that the overall charge and energy (including mass-energy) be conserved. After the majority (but not all) of hadrons and antihadrons annihilate each other at the end of the Hadron Epoch, leptons (such as electrons) and antileptons (such as positrons) dominate the mass of the universe. As electrons and positrons collide and annihilate each other, energy in the form of photons is freed up, and colliding photons in turn create more electron-positron pairs. The temperature of the universe falls to the point (about a billion degrees) where atomic nuclei can begin to form as protons and neutrons combine through nuclear fusion to form the nuclei of the simple elements of hydrogen, helium and lithium. After about 20 minutes, the temperature and density of the universe has fallen to the point where nuclear fusion cannot continue. During this long period of gradual cooling, the universe is filled with plasma, a hot, opaque soup of atomic nuclei and electrons. After most of the leptons and antileptons had annihilated each other at the end of the Lepton Epoch, the energy of the universe is dominated by photons, which continue to interact frequently with the charged protons, electrons and nuclei. As the temperature of the universe falls to around 3,000 degrees (about the same heat as the surface of the Sun) and its density also continues to fall, ionized hydrogen and helium atoms capture electrons (known as “recombination”), thus neutralizing their electric charge. With the electrons now bound to atoms, the universe finally becomes transparent to light, making this the earliest epoch observable today. It also releases the photons in the universe which have up till this time been interacting with electrons and protons in an opaque photon-baryon fluid (known as “decoupling”), and these photons (the same ones we see in today’s cosmic background radiation) can now travel freely. By the end of this period, the universe consists of a fog of about 75% hydrogen and 25% helium, with just traces of lithium. 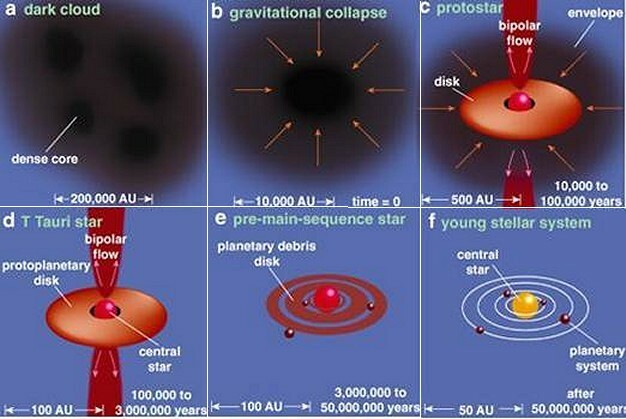 The period after the formation of the first atoms and before the first stars is sometimes referred to as the Dark Age. Although photons exist, the universe at this time is literally dark, with no stars having formed to give off light. With only very diffuse matter remaining, activity in the universe has tailed off dramatically, with very low energy levels and very large time scales. Little of note happens during this period, and the universe is dominated by mysterious “dark matter”. The first quasars form from gravitational collapse, and the intense radiation they emit reionizes the surrounding universe, the second of two major phase changes of hydrogen gas in the universe (the first being the Recombination period). From this point on, most of the universe goes from being neutral back to being composed of ionized plasma. Gravity amplifies slight irregularities in the density of the primordial gas and pockets of gas become more and more dense, even as the universe continues to expand rapidly. These small, dense clouds of cosmic gas start to collapse under their own gravity, becoming hot enough to trigger nuclear fusion reactions between hydrogen atoms, creating the very first stars. The first stars are short-lived supermassive stars, a hundred or so times the mass of our Sun, known as Population III (or “metal-free”) stars. Eventually Population II and then Population I stars also begin to form from the material from previous rounds of star-making. Larger stars burn out quickly and explode in massive supernova events, their ashes going to form subsequent generations of stars. Large volumes of matter collapse to form galaxies and gravitational attraction pulls galaxies towards each other to form groups, clusters and superclusters. Our Sun is a late-generation star, incorporating the debris from many generations of earlier stars, and it and the Solar System around it form roughly 4.5 to 5 billion years ago (8.5 to 9 billion years after the Big Bang). The expansion of the universe and recycling of star materials into new stars continues.